Siemens Home and Office Communication Devices (SHC) is expanding its portfolio of WiMAX subscriber devices with an Express Card. 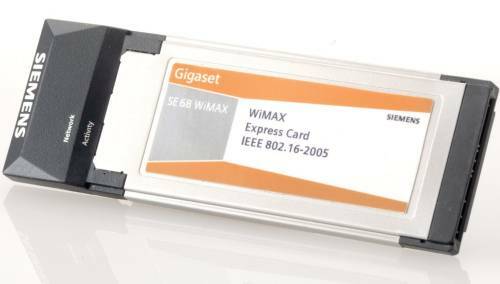 The Gigaset SE68 WiMAXExpress Card makes it easy for users to get broadband access via computer even on the road. The card is based on the IEEE 802.16-2005 standard, complies with the Wave 2 specifications, including MIMO (Multiple Input / Multiple Output) A and B, and supports beamforming. SHC demonstrates the card live at the WiMAX Forum Congress Asia in Singapore. The Express Card Gigaset SE68 WiMAX permits mobile broadband access at up to 20 Mbps and thus enables the use of very rich media and data applications on the road. As a result, it increases mobility and flexibility for professional and private users alike. Gigaset SE68 WiMAX complies with the Wave 2 specifications and therefore offers optimal capacity, throughput and network coverage. The card will be available in the summer of 2008 supporting the 2.5 and 3.5 GHz frequency bands. It supports the computer’s idle mode, thus reducing battery consumption. The Express Card can also be operated via a USB 2.0 port or a PC Card port with the aid of an adapter. The enclosed CD ensures simple installation of the software and guides users in a few easy steps through the set-up process.